Are Short Out-of-the-Money Put Options Risky? Traders often debate whether short out-of-the-money (OTM) or at-the-money (ATM) puts are riskier. The argument for OTM put options being riskier is that their Speeds (or dGamma/dspot) are higher than the ATMs’ ones, thus the Gamma, which is negative, can increase (in absolute value) substantially during a market downturn. m is a factor for margin. m=100% means that we sell a cash-secured put. Note that the above equation takes into account the margin requirement in an approximate way. The exact formula for margin calculation depends on brokers, exchanges and countries. But we believe that using a more realistic margin calculation formula will not change the conclusion of this article. It’s important to note that we focus here on the risks only. Hence we utilize the same values for the option’s implied volatility and the underlying’s realized volatility. In real life the puts implied volatilities are usually higher than the realized due to volatility and skew risk premia. This means that the strategy’s real-life expected return is normally higher. Our simulated return is more conservative. The table below summarizes the risk characteristics of short put options. 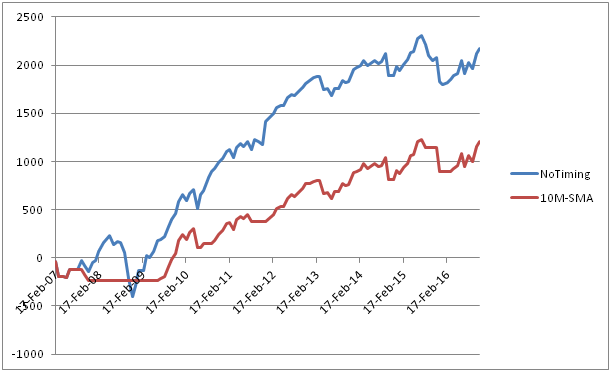 We observe that for the same level of leverage, short OTM put positions are actually less risky than the ATM ones. For example, for m=100%, i.e. a cash-secured short put position, the variance and VaR of the OTM position are 0.0031 and 0.1303 respectively; they are smaller than the ATM option’s counterparts which are 0.0075 and 0.1940, respectively. In summary, ceteris paribus, a short OTM put option position is less risky than the ATM one. The danger arises when traders use excessive leverage. Author rvarbPosted on August 23, 2017 August 24, 2017 Categories options trading strategiesLeave a comment on Are Short Out-of-the-Money Put Options Risky? In the previous installment, we discussed the use of a popular asset allocation/market timing rule (10M SMA rule hereafter) to size a short option position. The strategy did not work well as it was the case in traditional asset allocation. We thought that the poor performance was due to the fact that the 10M SMA rule is more of a market direction indicator that is not directly related to the PnL driver of a delta hedged position. 1-Dynamic: the option position is delta hedged dynamically; its PnL driver is the implied/realized volatility dynamics. The profit and loss at the option expiration depends on the volatility dynamics, but not on the terminal value of the spot price. 2-Static: the option position is left unhedged; the payoff of the strategy depends on the spot price at option expiration but not on the volatility dynamics, i.e. it’s path independent. 1-NoTiming: Sell 1-Month at-the-money (ATM) put option, no rehedge. 2-10M-SMA: we only sell an ATM put option if the closing price of the underlying is greater than its 10M SMA. Our rationale for investigating this case is that because the payoff of a static, unhedged position depends largely on the direction of the market, the 10M SMA timing rule will have a higher chance of success. As we can see from the Table and Graph, the 10M SMA rule performed better in this case. Although the win percentage and average PnL per trade remained approximately the same, the risks have been reduced significantly. The largest loss was reduced from $2.7K to $1.6K; drawdown decreased from $5K to $1.9K. As a result, the profit factor increased from 1.47 to 1.54. In conclusion, the 10M SMA rule performs well in the case of a static, unhedged short put position. Using this rule, the risk-adjusted return of the trade was enhanced significantly. While researching the literature on this subject, I came across a similar study presented by E. Sinclair . He showed that, for a delta hedged short strangle position, market timing based on the VIX index improved the results significantly. Since the VIX is a measure of volatility, its good performance is consistent with our understanding that for a delta hedged position, we should use a market timing indicator based on volatility and not on direction. Position sizing and portfolio allocation have not received much attention in the options trading community. In this post we are going to apply a simple position sizing rule and see how it performs within the context of volatility trading. An option position can be sized by using, for example, a Markov Model where the size of the position can be a function of the regime transition probability . While this is a research venue that we would like to explore, we decided to start with a simpler approach. We chose an algorithm that is intuitive enough for both quant and non-quant portfolio managers and traders. This remarkably simple timing rule has been used successfully by Faber and others. It has proved to significantly improve portfolios’ risk-adjusted returns . 1-NoTiming: Sell 1-Month at-the-money (ATM) put option on every option expiration Friday. The option is held until maturity, i.e. for a month. The position is kept delta neutral, i.e. it is rehedged at the end of every day. 2-10M-SMA: Similar to the above except that Faber’s timing rule is applied, i.e. we only sell an ATM put option if the closing price of the underlying is greater than its 10M SMA. Note, however, that unlike Faber, here we define the end of month as the option expiration Friday, and not the calendar end of month. A short discussion on the rationale for choosing a market timing rule is in order here. Within the context of portfolio allocation, the 10M SMA rule is used for timing the direction of the market, i.e. the PnL driver is mostly market beta. 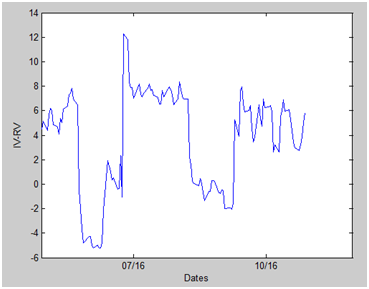 Our trade’s PnL driver is, on the other hand, the dynamics of the implied/realized volatility spread. 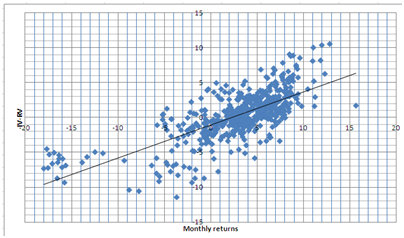 But as shown in a previous post, the IV/RV volatility dynamics correlates highly with the market returns. Therefore, we thought that we could use a directional timing strategy to size an options portfolio despite the fact that their PnL drivers are different, at least theoretically. We tested the 2 strategies on SPY options from February 2007 to November 2016. Table below provides a summary of the trade statistics (average PnLs, winning/losing trades and drawdowns are in dollar). As it is observed from the Table and the Graph, except for the worst drawdown, we don’t see much of an improvement when the 10M-SMA timing rule is applied. Although the 10M-SMA strategy avoided the worst period of the Global Financial Crisis, overall it made less money than the NoTiming strategy. The non-improvement of Faber’s rule in the context of volatility selling probably relates to the fact that we are using a directional timing algorithm to size a trade whose PnL driver is the volatility dynamics . A position sizing algorithm based directly on the volatility dynamics would have a better chance of success. We are currently extending our research in this direction; any comment, feedback is welcome. Is There a Less Expensive Hedge Than a Protective Put ? The spot VIX index finished last Friday at 11.28, a relatively low number, while the SKEW index was making a new high. The SKEW index is a good proxy for the cost of insurance and right now it appears to be expensive. A high reading of SKEW means investors are buying out of the money puts for protection. With the cost of insurance so high, is there a less expensive way for investors to hedge their portfolios? One might think immediately of cross-asset hedging. However, if we use other underlying to hedge, we will then take on correlation (basis) risk and if not managed correctly, it can add risks to the portfolio instead of protecting it. In this post we examine different hedging strategies using instruments on the same underlying. Our goal is to investigate the cost, risk/reward characteristics of each hedging strategy. Knowing the risk/reward profiles will allow us to design a cost-effective portfolio-protection scheme. 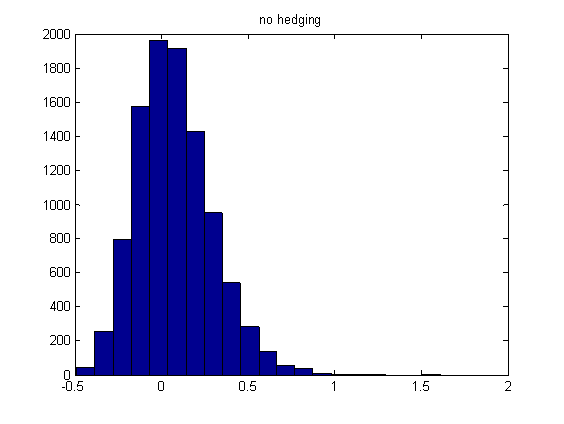 1-NO HEDGE: no hedging is performed. The asset is allowed to evolve freely in a risky world. This would correspond to the portfolio of a Buy and Hold investor. 2-PPUT: protective put. We buy an at the money (ATM) put in order to hedge the downside. This strategy is the most common type of portfolio insurance. 3-GAMMA: convexity hedge. We buy an ATM put, but we then dynamically hedge it. This means that we flatten out the delta at the end of every day. The GAMMA hedging strategy is not used frequently in the industry. The rationale for introducing it here is that given a high price of a put option, we will try to partially recoup its cost by actively scalping gamma, while we still benefit from the positive convexity of the option. This means that in case of a market correction, the gamma will manufacture negative delta so that the hedging position can offset some of the loss in the equity portfolio. Table below presents the expected returns, standard deviations and Value at Risks for the hedging strategies. As it is observed from the table, hedging with a protective put (PPUT) reduces the risks. Standard deviation and VaR are reduced from 0.048 and 0.318 to 0.024 to 0.118 respectively. However, the expected return is also reduced, from 0.075 to 0.052. This reduction is the cost of the insurance. Interestingly, hedging using gamma convexity (GAMMA strategy) provides some reduction in risks (Standard deviation of 0.029, and VaR of 0.248), while not diminishing the returns greatly (expected return of 0.066). In summary, GAMMA hedging is a strategy that is worth considering when designing a portfolio insurance scheme. It’s a good alternative to the often used protective (and expensive) put strategy. We note that the simulations were performed under idealistic assumptions, some are advantageous, and some are disadvantageous compared to a real life situation. However, results and the conclusion are consistent with our real world experience. GBM stands for Geometric Brownian Motion. Author rvarbPosted on March 24, 2017 May 20, 2017 Categories options trading strategies7 Comments on Is There a Less Expensive Hedge Than a Protective Put ? Last month was particularly favorable for short volatility strategies. In this post, we will investigate the reasons behind it. First, the main PnL driver of a delta neutral, short gamma and short vega strategy is the spread between the implied volatility (IV) and the subsequently realized volatility (RV) of returns. Trading strategies such as long butterfly is profitable when, during the life of the position, RV is low compared to IV. 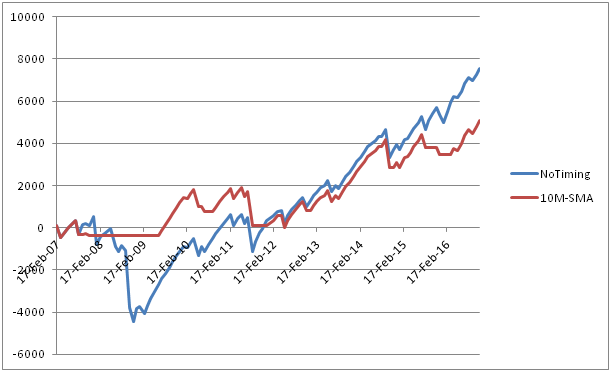 The graph below shows the difference between IV and RV for SP500 during the last 5 months. (Note that RV is shifted by 1 month, so that IV-RV presents accurately the spread between the implied volatility and the volatility realized during the following month). As we can see from the graph, IV-RV was high, around 4%-7%, during October (the area around the “10/16” mark). Hence short volatility strategies were generally profitable during October. This means that when IV-RV is high, SP500 usually trends up. This was the case, for example, during the month after Brexit (see the area around the “07/16” mark on the first graph). However, when the market trends, the cost of hedging in order to keep the position delta neutral is high. By contrast, even though IV-RV was high in October, the market moved in a range, thus helping us to minimize our hedging costs. 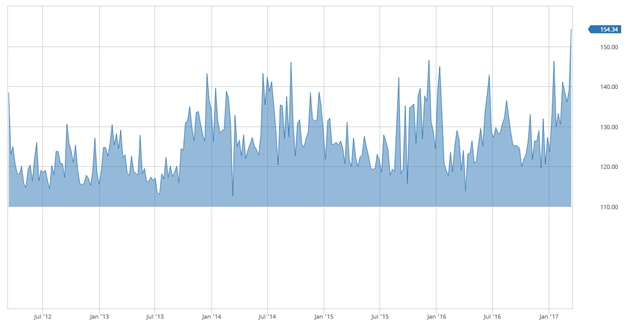 This factor therefore contributed to the profitability of short volatility strategies. In summary, October was favorable for short volatility strategies due to the high IV-RV spread and the range bound nature of the market. The favorite long-shot bias is a phenomenon that has been studied extensively in gambling markets. A question has arisen naturally: does this bias exist in financial markets? In a paper entitled “The Favorite /Long-shot Bias in S&P 500 and FTSE 100 Index Futures Options: The Return to Bets and the Cost of Insurance”, Hodges, Tompkins and Ziemba examined whether the favorite/long-shot bias that has been found in gambling markets (particularly in horse racing markets) applies to options markets. The motivation came from the fact that puts and calls on stock index futures represent leveraged short or long positions on the index and their behavior might have similar features to racetrack bets. The authors found that both call and put options on the S&P 500 (and FTSE 100 to some degree) with one and three months to expiration display a relationship between probabilities of finishing in the money and expected returns that is very similar to the favorite long-shot bias in horse racing markets. In another word, they found evidence that was consistent with the hypothesis that investors tend to overpay for put options as the expected cost of insurance and call options as low-cost, high-payoff gambles. This finding is consistent with results published by other researchers under the general framework of the volatility risk premium which refers to the fact that implied volatility in equity index options often tends to overstate realized volatility. In fact, the favorite/long-shot bias provides an alternative explanation for the existence of volatility risk premium. For practitioners, a question arose: how to structure a position that takes advantage of the favorite long-shot bias?